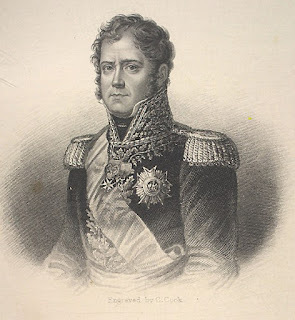 On 6th December 1815 Marshal Michel Ney was executed by firing squad in the courtyard of the Palais Luxembourg, Paris. He refused to wear a blindfold and gave the order in person for the soldiers to shoot. Michel Ney, born in 1769, had been a provincial civil servant of lowly origins until he decided to join the army, through which he made rapid promotion during the French Revolutionary Wars, displaying considerable personal bravery at a number of major engagements. Indeed, Napoleon Bonaparte was to call him “the bravest of the brave”. Ney received his marshal’s baton in 1804 and was a loyal general to Napoleon. He commanded the rearguard during the 1812 retreat from Moscow and was popularly regarded as the last Frenchman to leave Russian soil. However, it was Ney who led the “revolt of the Marshals” in 1814 when it became clear that Napoleon’s reign was over. Ney demanded that Napoleon should abdicate, which he did. Marshal Ney’s reward was to be given promotion by the incoming restored king, Louis XVIII, who clearly recognised Ney’s genius as a general, despite his previous loyalty to Napoleon. When Napoleon escaped from his exile on Elba and began his march towards Paris, Ney set off with a force to counter the threat. However, when Ney met Napoleon at Auxerre he switched sides again and supported Napoleon’s return to power. Ney was an important commander at the Battle of Waterloo on 18th June 1815, although he made a fatal mistake in not ordering captured cannon to be “spiked” so that they could not be used if recaptured, which is in fact what happened. Ney was subsequently arrested and tried by the victorious royalists for the offence of treason, and his execution swiftly followed the guilty verdict. However, there is a twist to the story because rumours circulated that the troops of the firing squad only fired blanks and Marshal Ney faked his death and escaped to the United States, where he worked for many years as a schoolmaster named Peter Stuart Ney. As with all conspiracy theories, this one must be taken with a large dose of salt!